*Full disclosure: I am a long-standing, card-carrying SkyTeam member [ATL, hollah] which means I happily fly Alitalia all over so when Alitalia invited me on the inaugural Rome-Mexico City flight, of course I said Yes. Picture this: I am about to spend 12 hours on a plane with a bunch of well-dressed Italians that I don't know. Then within 72 hours, I am going to do it again in reverse. And I'm going to do it in style. . . . . To be honest, I know it's going to go well because 1) I have a brand new jump suit 2) I'm flying Alitalia Business and 3) I'm a self-proclaimed expert passenger, albeit Economy, having miled up on every kind of Alitalia experience over the past few years: domestic (Torino, Palermo, Catania, Bari), continental (Paris, Berlin, Madrid, Barcelona), international (London, Tunis, Istanbul) and transatlantic (LA, Tokyo, Miami). I know, or at least, I think I know all of Alitalia's ins and outs so I continue to fly with them for three simple reasons: necessity [Skyteam, yo! ], logic [I live in Rome], and quality of service. The Alitalia team has always been incredibly kind and helpful, considering that my usual travel companions have been excellent trials for even the most experienced in flight person: Screaming Baby [who is now Curious 7 Year Old] and Small Child with Reliable Motion Sickness [now Too-cool-for-school Teenager with Reliable Motion Sickness]. Yes, I'm ready for my upgrade. 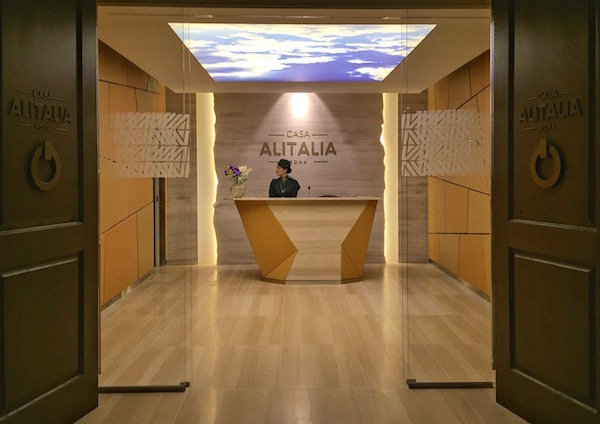 First things first, I head to the new Casa Alitalia, a series of sleekly designed rooms of marbles, light woods and dark glass, with red accents and museum-piece furniture. I laugh because I know that style and I feel right at, well, home. Casa Alitalia was designed by star architect Marco Piva, who I once chance-encountered in a hotel lobby. It's cool, easy flowing and completely Italian-- from the top notch cappuccino (always my first test) to lounges (Poltrona Frau) and food selection at the buffet, bar and live cooking area. Ssadly, I am too too early for the pizzas. As I grab my cappuccino, a red-and-green outfit catches my eye. Today is the debut of designer Ettore Bilotta's new Alitalia uniform. And I love them. Tailored, subtle, smart. I immediately think of my favorite Sophia Loren photo thanks to those beautiful pencil skirts, darted jackets, tilted caps, and clever accents- scarves and gloves. Oh, those gloves! Complimenti, Bilotta, you just brought back style to traveling by the grace of a tone-tone glove and I hope everyone follows in suit from inflight crew to passengers. It's a Mad Men reverie, or perhaps the full circle from an era of Juicy Couture sweats. I'm contemplating how I am going to integrate gloves into my everyday when the Alitalia staff tells me that her I fabulous gloves are made in Naples, and every piece of the uniform (mens and women) is 100% made in Italy. 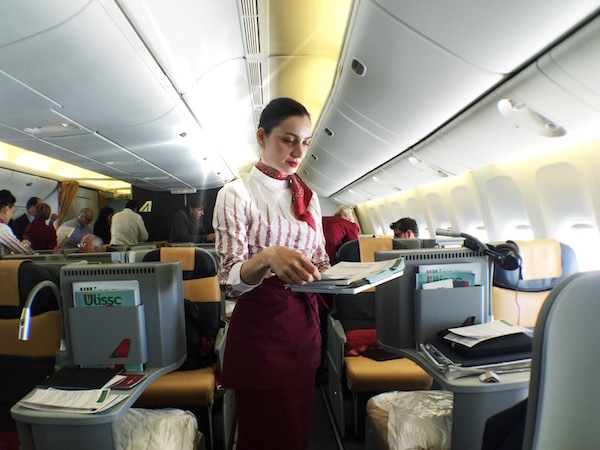 Even better are the nail polish and lipstick colors- a striking red Rosso Alitalia created by Diego della Palma. But I don't have any more to size up the tailleur. I have a flight to catch. I side step the mariachi band celebrating the inaugural flight, show my passport and head to the cabin. Seatbelt clicked, chair in the upright position, and I am ready to spend the next 12 hours entertaining myself. Time to make friends, I think, as I share aperitivi with the gentleman to my left who happens to be Italy's Minister of Culture. He is concerned about the wifi as am I, only to find out that our plane (Boeing 777) is not yet outfitted for it [coming soon]. 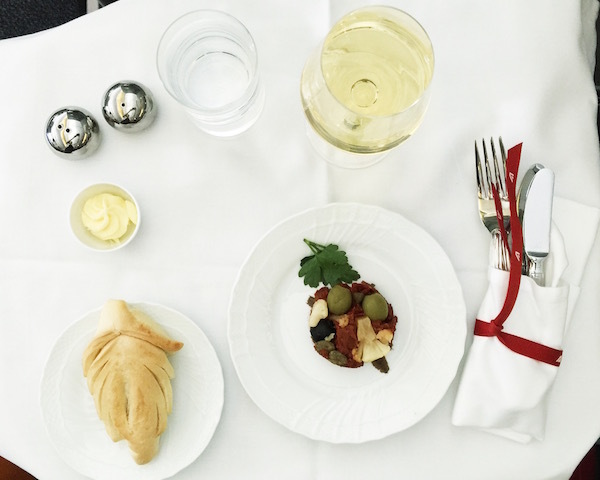 It's okay because I end up talking with Alitalia's executive inflight chef about lunch. He tells me that his goal for the 12 hour flight, and all flights, is to give an authentic Italian meal- in particular Business Class whose menu includes antipasto, primo, secondo, frutta and dolci- all excellent, as I expected. In fact, Alitalia has always had great inflight food, no matter what class you are in. Now it's just a little more refined and regional. I give myself a mini-spa treatment with the Bulgari kit from Alitalia, close my eyes but can't sleep, no surprise. I watch Point Break, the reboot, and am inspired to do the exercises in the back pages Ulisse, Alitalia's inflight mag which has also undergone a make-over [I love the new paper and can't wait to read more interviews]. The work out is eerily similar to the stretches and leg extensions my mother always tells me to do whenever I fly- short or long haul, and I tell that to the air hostess who is watching me in the small space by the bathroom. We talk make up, contact lenses, children, and long haul flights. I fangirl her uniform and she tells me how incredible it feels that the uniform alone makes everyone happy. As I head back to my seat, I realize we've bounced back and forth in Italian and British English. I have no clue why I have an accent. My neighbor wakes up and tells me to get ready for Mexico City.